In sync with our annual Hope Lives series, we’re getting together for a night of food, fun, music, singing and an epic DJ bash! 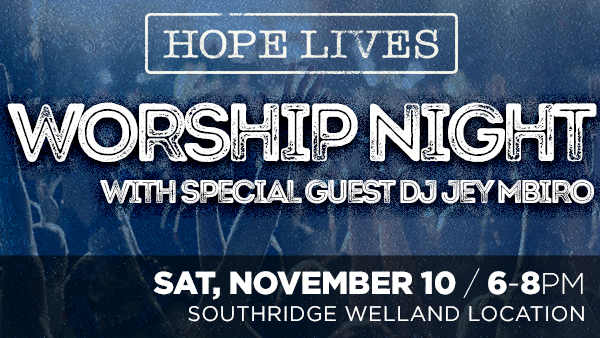 On Saturday, November 10th starting at 6:00pm we’ll meet at our Welland Location. The night will include some food and a chance to connect as one church with friends from across our Southridge locations. As we get into things, we’ll have a time of singing and celebration, embracing the opportunity to worship together. Then we’ll close out the night with a special guest DJ, Jey Mbiro, who will spin some tunes for us to enjoy (and possibly bust a move?!)! Jey is a Compassion International advocate who was born and raised in Kenya as a sponsored child in the Compassion Child Development Sponsorship Program. Jey will be sharing his story with our community on Sunday morning (November 11). But in addition to having an incredible story to tell, Jey is a DJ and is pumped to share his musical talents with us as well. So let’s make it a priority to be together as one church, celebrate the gift God has given us in each other, and get our groove on with a night of energetic worship and praise! Come with your family, friends or Life Group, and invite anyone else you think might be interested. Things should wrap up by 7:30 or 8ish, in time to catch Coach’s Corner or get out for a beverage with a group of friends. NOTE TO STUDENTS & PARENTS: For all our high school students involved in CURRENT, this event will be our monthly large group get together as we have some fun at this church-wide DJ bash!